Markets are higher this morning on optimism about further QE in Europe. Bonds and MBS are down. Initial Jobless Claims came in at 294k, slightly higher than expected, but below the 300k rate. Challenger Job Cuts increased 6.6%, and the Bloomberg Consumer Comfort Index rose to 43.6. President Obama announced that FHA is lowering fees. The fee for a FHA loan will drop from 1.35% to .85%. Prior to the crisis, the fee was .55%. The hope is that this will jump-start the housing market and entice the first time homebuyer to return. Certainly the value proposition between buying and renting is highly favorable and rents are increasing. Secondly, he will take aim at lender overlays and direct FHA to cut red tape and provide more clarity to lenders. He will give a speech today in Phoenix, and is supposed to address this initiative further. The FOMC minutes were taken as slightly dovish by the markets. They mentioned Q3 GDP being large, but attributed it to higher than expected government spending which is unlikely to be repeated. They also didn’t address unwinding their book of MBS and Treasuries, which was mentioned at the June FOMC meeting. The Street is still thinking that rates will start going up at the June meeting, however it seems like the forecast for the rate of increases may be slowing – in other words instead of raising the Fed Funds rate 25 bps at each meeting, raising it 25 bps at every other meeting. Chicago FRB President Charles Evans (a dove) said yesterday that inflation might not hit the Fed’s target until 2018, and that we should probably not increase the Fed Funds rate until 2016. Certainly falling energy prices gives the Fed more room to maneuver. Certainly the Fed is cognizant of 1937, where they increased reserve requirements (a form of tightening) and sent the economy into a tailspin. This was the “recession in the Depression” where the Dow Jones Industrial Average got cut in half over the course of a year. Incidentally, this was also where the “smart money” got carried out. 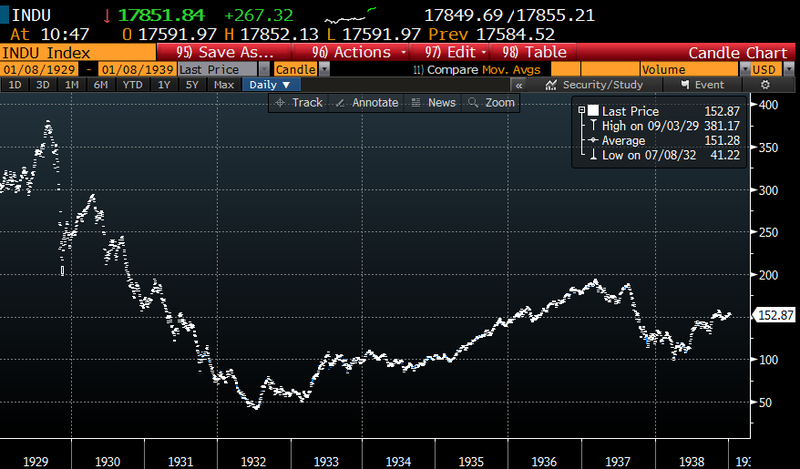 The smart money was short in 1929, but long in 1937. Bernanke was a student of history and is a Great Depression expert. Janet Yellen is very similar to Bernanke, and it seems is willing to risk higher inflation in order to take a 1937 off the table. 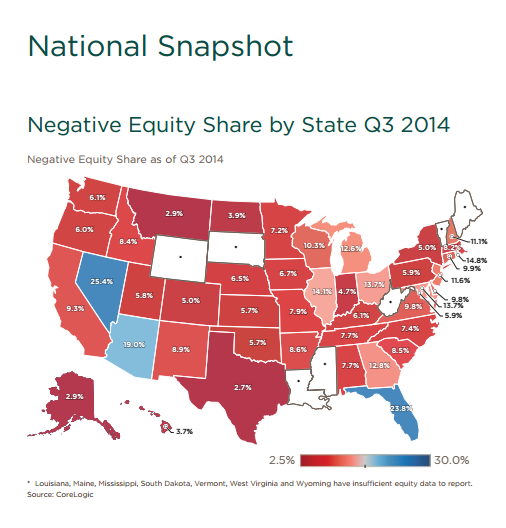 Negative equity fell by $10.2 billion, or 10.3% in the third quarter, according to CoreLogic. 19% of residential mortgages have less than 20% equity, and 2.6% of mortgages have less than 5% equity. Negative equity has been a drag on economic growth in a number of ways – first, it dampens consumer spending, but more importantly, it creates friction in the system, making it difficult for people to leave areas where there are few opportunities and go to where there are more opportunities. Think of unemployed auto workers in the Rust Belt who would gladly take jobs in the energy patch if they could sell their home in Ohio and move to North Dakota. When talking about cheap energy, everyone likes to talk about oil or gasoline prices, which makes sense – that is the most visible data point. 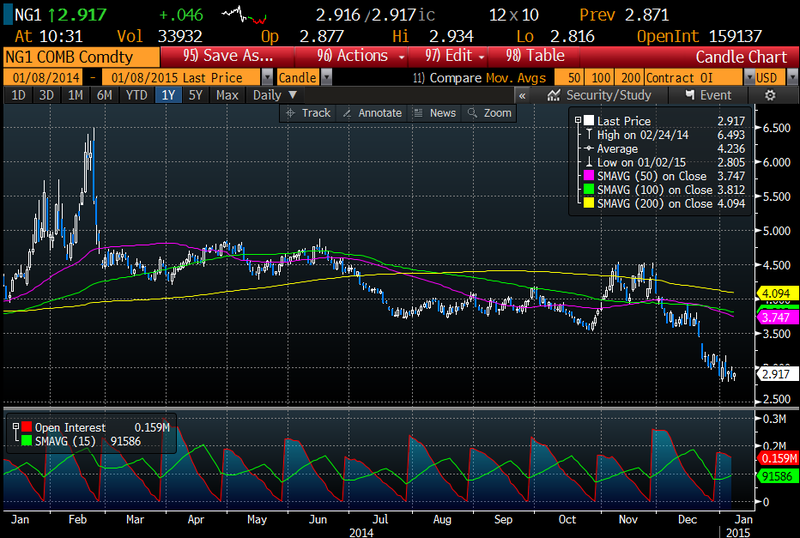 However, natural gas has been absolutely pummeled, trading below $3.00 right now. This means lower electricity prices going forward, and is one of the big reasons why we are seeing manufacturing (especially energy-intensive manufacturing) return the the US. This a failure of Boehner’s leadership team. They apparently have no contact with their party’s base. I guess the Tea Party is not dead? Judge Spencer’s statement on sentencing McDonnell is worth a read. Having been in his courtroom on another matter, I can say that he lives up to the positive press.